Dogecoin, otherwise recognized as DOGE is an open source cryptocurrency, which has developed into an enjoyable, friendly and easy-to-use internet currency. Much Wow. What is Dogecoin? Find out in our awesome guide. So, if you’re asking yourself “What is Dogecoin?” or any other related questions you have come to the right place, as this comprehensive guide will provide you with all the answers you need. Dogecoin has an extremely active and passionate community, with members known as the ‘Shibes,’ that have taken part in multiple social causes and fundraisers. The price of Dogecoin has been volatile but overall it has increased in value and at one point reached a market capitalization of beyond $1 billion. Regarding its distribution, the coin had a fast initial production schedule, with 100 billion coins having already been mined by the middle of 2015. Currently, Dogecoin has a circulating supply of more than 118 billion. While its main use is as an online digital currency, it has gained footing as a tipping system, in which internet users grant tips paid in Dogecoin to other users who post content that they enjoy. Dogecoin is an open source digital currency that is used by internet users worldwide. The framework is based on Litecoin, meaning that all modifications and updates made to it will also be made to Dogecoin. The initial aim of the coin was not to create an innovative technology or something novel and impressive, but rather to create an easy to use transaction platform. Dogecoin has a strong and loyal userbase who use Doge as a currency rather than just hold it as a speculative asset. Although, like other cryptocurrencies, Dogecoin can definitely be held as an investment or traded in pursuit of making a profitable return. Where Did Dogecoin Get Its Name? Dogecoin got its name from the original ‘doge’ internet meme, which is based on a photo of a Japanese Shiba Inu dog. Doge memes are created using different Shiba Inu photos surrounded by text in the Comic Sans font. The text is written in an improper form such as ‘wow‘ and ‘much increase‘ and is meant to portray what the dog is thinking. The Dogecoin logo is the face of the Shiba Inu dog, with a big letter D on it. There is a slight disagreement on the correct pronunciation for Dogecoin. 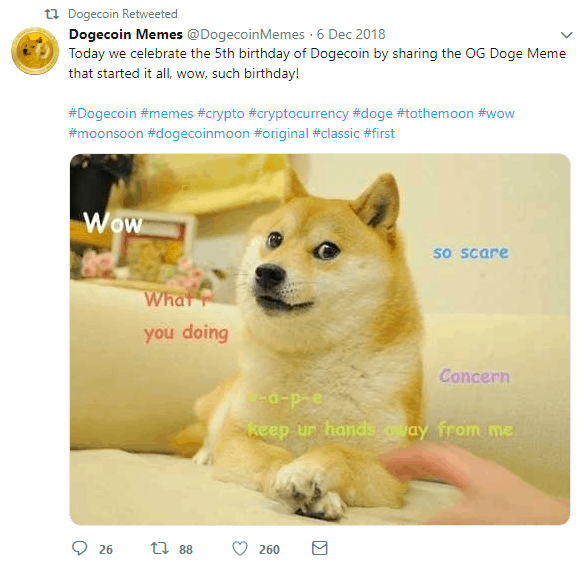 As stated above, while Dogecoin initially started as a joke, it quickly gained a lot of traction, and a very strong community was built around it, which now is one of Dogecoin’s greatest assets. The community members, who are also referred to as “Shibes” have been known for various charity donations and other altruistic causes. The community enjoys a substantial following on social media. The Reddit group /r/dogecoin has 129k subscribers or ‘Shibes,’ and they use Dogecoin to tip each other for posting enjoyable content. Furthermore, charities such as DogePizza and SocksForTheHomeless use Reddit as a platform to raise money for good causes. This Dogecoin community, on top of being one of its strongest assets, has been key to its survival and success until now. No other ‘meme coin’ has enjoyed success like Dogecoin has. 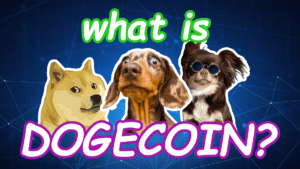 A common phrase used by Shibes is ‘1 DOGE = 1 DOGE,’ meaning that they believe the coin should be used as a transactional currency, instead of being used solely as an investment or speculative asset. 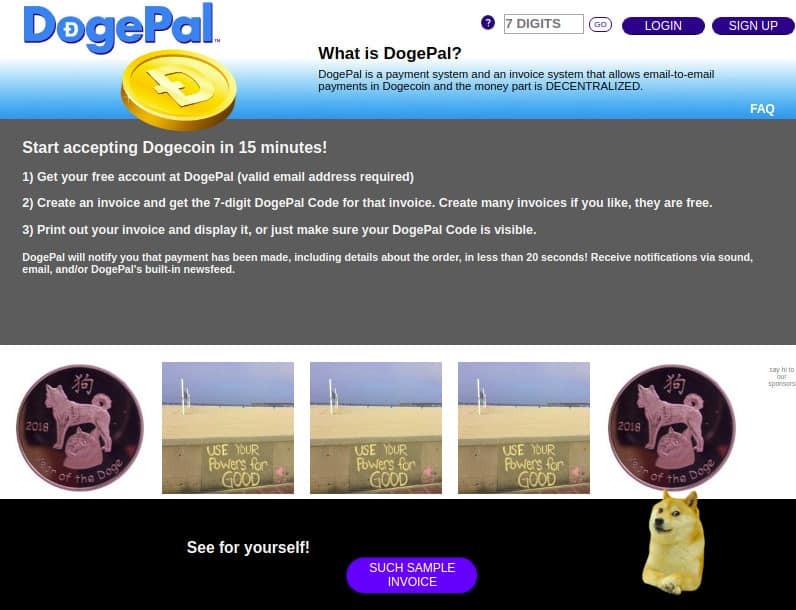 The community actively contributes to Dogecoin, even creating new applications like DogePal which is a system that enables people to pay each other with Doge, using email addresses. Check out our interview with DogePal founder Tom here. Was Dogecoin Really Started As a Joke or Meme? It received a lot of encouragement from the Twitter-sphere, also catching the interest of Billy Markus, a software engineer, who later contacted Jackson Palmer about creating something real with Dogecoin. Then, on December 6, 2013, Dogecoin was created, allowing anyone to mine and/or trade it. The hype around it quickly grew, so what started as a joke very rapidly became a major cryptocurrency. Dogecoin was intended to be fun and to have a less serious vibe than other cryptocurrencies. In 2013 when Dogecoin was created there were much fewer cryptocurrencies around than today, and most of them had a serious vibe or political motives. One thing that separates Dogecoin from the majority of other cryptocurrencies is that it is an inflationary, rather than deflationary cryptocurrency. Bitcoin and the majority of other cryptocurrencies that can be mined are created with a hard cap on the supply of coins. The main issue arising from deflationary coins is that they encourage hoarding as their perceived values increase with time. Also, once a hard cap is hit, it is not profitable for miners to continue sustaining the system. Thus, an inflation-based tactic was designed so that mining would be maintained and to replace lost coins, helping to keep the supply stable at close to 100 billion tokens. Dogecoin has a fixed rate of production of 10,000 coins per minute. Furthermore, since most of the community do not consider Dogecoin purely an investment, rather a medium of exchange, inflation could be an important factor in its success. How Does Dogecoin Compare to Litecoin? The main structure of Dogecoin is based on Luckycoin, which in turn is based on Litecoin. Dogecoin originally featured a randomized reward system, with rewards received for mining blocks of coins. This was later changed to a fixed block reward in 2014. Both Dogecoin and Litecoin employ a proof-of-work algorithm and use Scrypt technology. However, unlike Litecoin, the supply of Dogecoin does not have a cap. Since 2014, Dogecoin and Litecoin mining has been merged, which means it’s possible to mine both coins with the same process. Extremely low Transaction fees, around $0.01. Fast transaction times as it takes less effort to calculate the mining computations. A user-friendly interface. A fun and welcoming community. Note: Dogecoin is a major cryptocurrency that has built a strong community where users can have fun while simultaneously getting familiar with crypto. How Does Dogecoin Mining Work? Before being verified, Dogecoin transactions are included in a block. The miners’ check the received transactions with previous transactions on the blockchain. If no data recording the same transactions is detected, the miners confirm the new block of transactions. These blocks are sent for verification to the nodes of the Dogecoin network. When the nodes verify a block of transactions, they enter into a type of lottery. Only one node can win the reward from the lottery. The lottery involves solving a mathematical equation. The node that solves the equation first adds the new block of transactions to the blockchain. The reward for solving the mathematical equation is 10,000 DOGE. As the mining process necessitates massive amounts of electricity and time, this reward is paid to miners for each mined block. This acts as an incentive for miners to give their hashing power. The mining reward has not always been the same. However, after the 600,000th block was mined, a permanent reward of 10,000 Dogecoin was put in place by the developers. How Can I Mine Dogecoins? Litecoin and Dogecoin merged mining in 2014 and both use Scrypt, which demands less power than Bitcoin’s SHA-256 algorithm. If you are familiar with Litecoin mining, DOGE mining may be relatively easy for you. Dogecoin mining is also a lot quicker than Bitcoin as its mining difficulty is at least a million times less than Bitcoin’s. This also means that you can mine the coin with less powerful computers. The block reward for each block is 10,000 DOGE and on average, a new block is generated every minute. Just like every other mineable cryptocurrency, miners have the choice to go solo or operate in mining pools. Mining pools are groups of users who share their computing power and receive a share of the block reward. Pools have higher combined computing power than solo users, and therefore, they confirm blocks more often. Each miner in the pool gets a small portion of the total reward generated by the block. Members of the pool will usually pay a fee to be a part of the group. When you mine Dogecoin solo, you won’t have to pay any fees for mining. However, you will be exposed to the immense competition, and it could be weeks (sometimes months) before you get to mine a block on the network. However, once you do this, the entire mining reward is yours for the taking. How to get Started with Dogecoin Mining? To begin with, you will need a PC running and a working internet connection. You will also need a Dogecoin wallet to store the mining rewards you earn. Ideally, you want to use a powerful CPU (even though an average PC CPU is powerful enough, it may overheat), or a GPU like the Nvidia GeForce GTX series. Depending on what hardware you use, you will also need to download the appropriate software to go with it. The software can be found online and downloaded for both CPU and GPU. If you are mining using a GPU, a few software options include CGminer, EasyMiner, and CudaMiner. A CPU miner can be downloaded for free here. Another hardware option is a Scrypt ASIC Miner like the Bitmain Antminer L3. MultiMiner would be the appropriate software to use in this instance, but EasyMiner and CGMiner will also work for ASIC miners as well. The most suitable option for beginners looking the test the waters would be GPU mining. After, if you want to get more seriously involved with mining you could consider a GPU or ASIC mining setup. The easiest way to earn some DOGE would be to opt for cloud mining, but you need to investigate whether you can be profitable or not and how long that would take. With cloud mining, you simply rent computing power from a data center which is charged as a yearly or monthly fee. The center mines the coins and sends a share of the profits to you. The only requirement for this is a Dogecoin wallet and the money needed to rent the cloud resources. 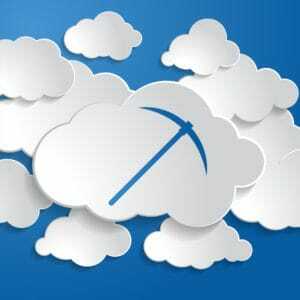 Cloud mining can be cheaper to set up than your own mining operation. It also removes all the technical hassle involved with Dogecoin mining. However, the contracts could be long-term, and it may be difficult to calculate whether you are getting good value for the cost or not. Price fluctuations could also cause problems as the cloud mining contract will be fixed, and if mining becomes unprofitable, you will still be tied to the contract. Dogecoin has also been used by its community often in fundraising initiatives, such as helping Olympians attend the winter Olympics and raising funds to build clean water wells in developing countries. $50,000 was raised in order to fund the Jamaican Bobsled Team journey to the Winter Olympics in Sochi in 2014. In March 2014, the community raised $30,000 in order to build wells that provide clean water in Kenya. 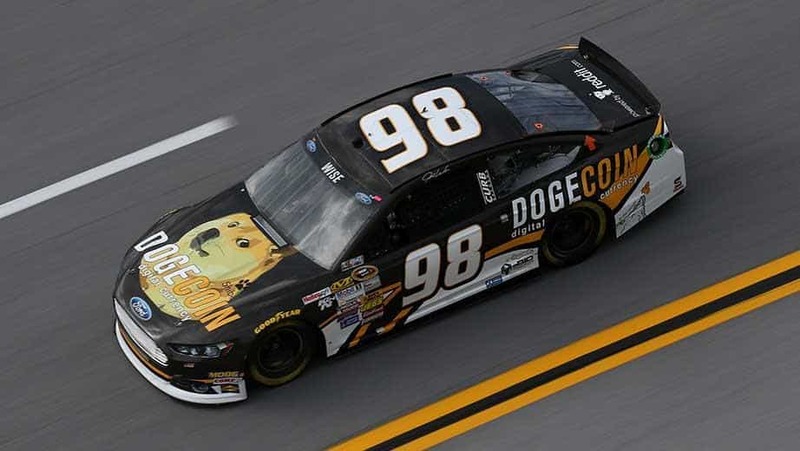 The community raised $55,000 in order to sponsor a NASCAR driver (Josh Wise) who then raced in a Dogecoin themed car. As Dogecoin’s transaction times are quick, averaging close to a minute, Doge has also gained popularity as a donation or tipping coin. Dogecoin can also be used for speculation or held as an investment with the goal of making a profit. 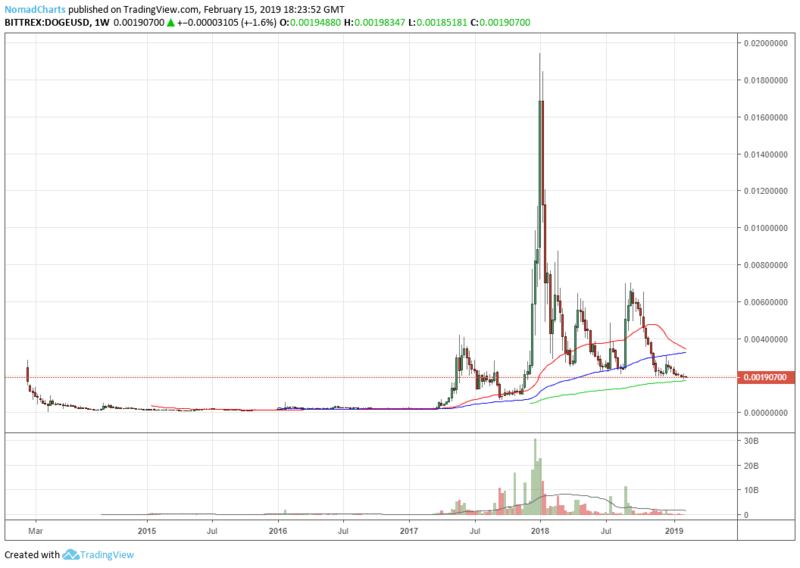 Since its creation, Dogecoin has seen many peaks and troughs in its price creating lots of opportunity for speculators. The first exchange which offered a DOGE/USD market was AltQuick.co in 2014. Later on, the Canadian Vault of Satoshi exchange became the first exchange to offer the DOGE/CAD trading pair. DOGE can now be traded in many exchanges around the world. Dogecoin was officially launched on December 6, 2013. It was created by Billy Markus, a programmer from Oregon, and Jackson Palmer, a product manager at Adobe. During the cryptocurrency craze of 2013, Billy Markus wanted to create a cryptocurrency which had a less serious vibe than Bitcoin. He believed that this would appeal to a broad user base and also be something unique that separates itself from other cryptocurrencies. He teamed up with Jackson Palmer, who conceived the original idea for ‘Dogecoin’ through a comical tweet. Palmer was encouraged on Twitter to make his ‘joke’ idea a reality, which he then later did with Markus. The Dogecoin team is made up entirely by volunteers. The founding duo of Billy Markus and Jackson Palmer now go by the moniker “Shibetoshi Nakamoto,” a name intended as a play on the name of the creator of Bitcoin, Satoshi Nakamoto. However, Jackson Palmer is no longer involved with the project. The developing team consists of names such as Ross Nicoll, Patrick Lodder, and Max Keller. You can find our interview with Ross Nicoll here. How Has Dogecoin’s Price Fared Historically? 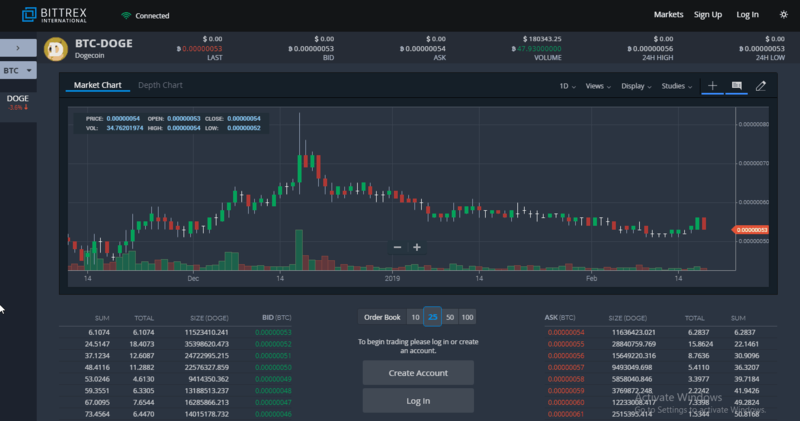 Like the majority of cryptocurrencies, Dogecoin has been subject to massive fluctuations in price, going from lows of $0.0001 in late 2015 to a high of $0.019 on January 7th, 2018. Will DOGE Ever Reach $1? The extremely high supply makes it unlikely to hit a high price such as $1 since while the inflationary nature improves its chances to be used as a mediator currency, it also decreases its investment potential somewhat. How Can I Buy Dogecoin? Buyers from the EU can buy Dogecoin directly from www.litebit.eu. Furthermore, there are multiple exchanges which support Dogecoin, and offer pairs such as DOGE/BTC and DOGE/ETH. 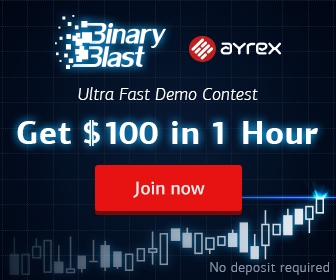 The most popular exchanges that do so are Bittrex, Poloniex, and HitBtc. While this article does not aim to offer financial advice, and you should always do your own research when making any investments. The cryptocurrency market in the eyes of some is a bubble that has already burst, while others see it as a nascent industry that will eventually go on to change the world in a similar manner to how the internet did. Can I Buy Dogecoin on Coinbase? No, Dogecoin is currently not listed on Coinbase. In order to buy through Coinbase, it is required to buy another crypto coin, transfer it to an exchange which supports Dogecoin and then buy it. Which Wallet Can I Use to Hold Dogecoin? There are different wallets which support the storage of Dogecoin. Firstly, there are software wallets for download, such as Dogecoin Core, which contains the full Dogecoin blockchain, and effectively turns your computer into a Dogecoin Node. Dogecoin co-creator Billy Markus recently tweeted to remind his followers to upgrade to the latest version of the Dogecoin Core Wallet. Then there is MultiDoge, a light wallet which stores enough information in order to use Dogecoin but will not turn your computer into a Node. There are also Online wallets such as Dogechain, which allows you to use the blockchain without storing it on your computer. Finally, there are Hardware wallets, such as the Ledger Nano S which are hardware devices that are fully portable and allow you to store Dogecoin. Once you possess a secured wallet, transferring DOGE is as easy as clicking a “Send” button in the application. You only need to specify the recipient’s address, enter the coin value and a label which allows for easy tracking of the transaction. How Long Do Dogecoin Transfers Take? Dogecoin possesses a one minute block time; therefore the average transaction time is around one minute. How Many Dogecoins Are There in Circulation & Is There a Cap on the Maximum Number of Dogecoins? As stated above, Dogecoin does not have a supply limit. Right now, there is more than to 118 billion Doge in circulation, with the price being $0.0019. 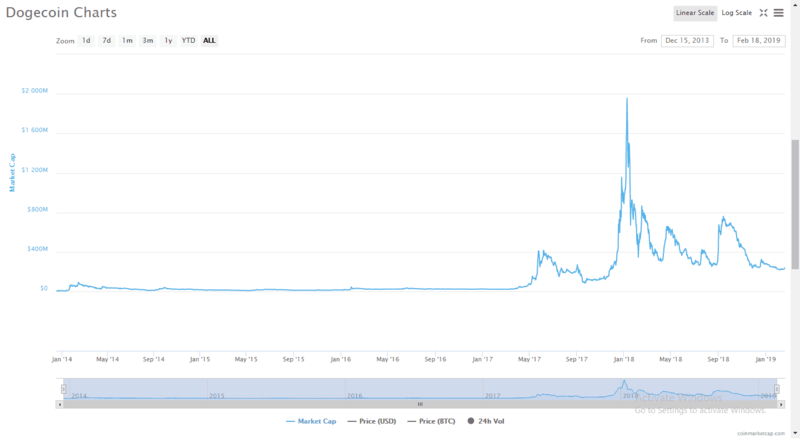 The current market cap is $225,000,000; however, at one point in January 2018, it surpassed $1 billion for a short time. The market cap changes daily, so it’s worth checking a resource like CoinMarketCap for the latest valuation. The potential problem with having a supply cap like many cryptocurrencies do is that once that cap is reached, mining could become unprofitable for miners. This could lead to either extremely high transaction times (due to less incentive to process transactions) or extremely high fees (to encourage miners to mine). To solve this problem, the creators of Dogecoin wanted to ensure miners that they would always receive new Dogecoin as a reward, so there is always an incentive for mining Dogecoins. The Future: What’s Next for Dogecoin? In a recent interview with Blokt, leading developer Ross Nicoll stated that he wants to see Doge widely adopted as a currency for the Internet, and he believes there is an exciting opportunity to make this happen. He also wants to see Dogecoin become part of the Ethereum Ecosystem. The Dogecoin team is currently working on a Dogecoin/Ethereum bridge which would enable this. To conclude, even though it began as a lighthearted joke that made light of the cryptocurrency craze, Dogecoin has evolved into a genuine and major digital currency. 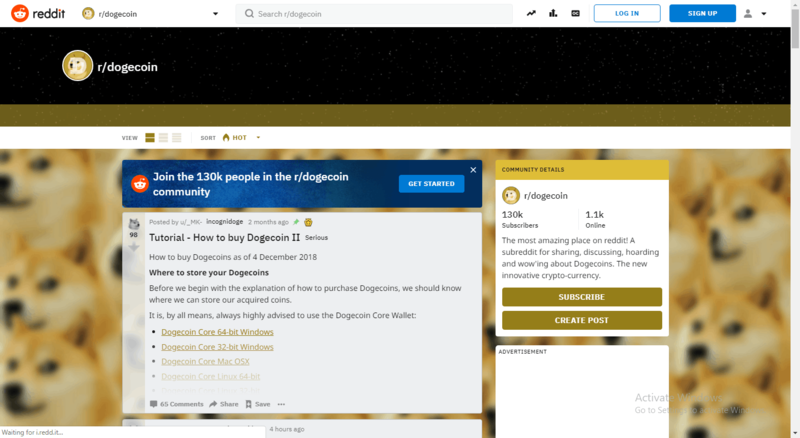 Dogecoin possesses one of the biggest thriving communities, full of helpful and friendly members, who are also working to further the adoption of the coin. This has been a big factor in the success of Dogecoin and will continue to be so in the future. Furthermore, the loyal community of Shibes constantly uses the coin instead of holding it as purely an investment. Even after the departure of the co-creator Jackson Palmer years ago, the project has continuously thrived, due in part to the passionate and enthusiastic Shibe community. What Is Dogecoin & How Does It Work? The Ultimate DOGE Guide was originally found on copy trading cryptocurrency | Blockchain News | Bitcoin News | blokt.com.